Just slide your artwork into the crystal clear polypropylene "pocket" pages for a highly organized and ever lasting artistic presentation. 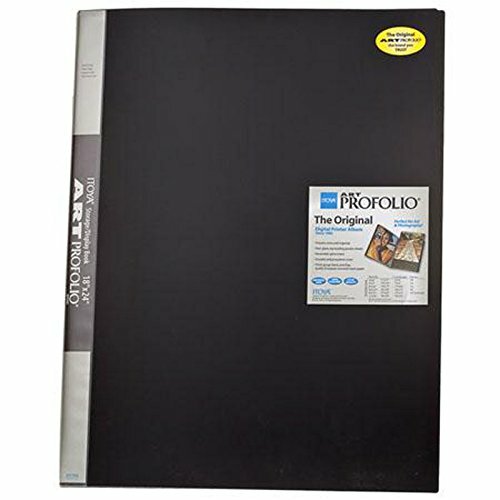 Art Profolio is made of durable polypropylene. Each of the permanent polypropylene pocket pages are designed to lie flat while open. The only storage/display book of its kind! Accept no imitations! Completely acid-free through its polypropylene, PVC-free construction and quality crafted, black acid-free mounting paper provided in each page. Archival safe for all your art storage needs. Great for storing photographs and film of all sizes. Top-loading, clear polypropylene sheets will not stick to copier toner and is also ideal for storing a vast array of artwork and memory projects. - Size: 17" x 22" Photo. 24 sleeves for 48 views. - Durable polypropylene cover. Clear top-loading polypropylene pocket pages. - Thick gauge, acid-free black mounting paper. 100% acid-free and archival safe. - A reversible spine insert; which allows for customized titling and organization. - Inner cover pocket (included on most sizes) for quick-access storage.